Excessive exposure on the sun, especially during summer causes negative effects on the skin such as spots on the face. The best way to prevent this is to stay well hydrated and protect from ultraviolet rays with a sunscreen of 50. This time I bring several tricks inexpensive way to remove these stains on the face that causes us the sun and is nothing more and nothing less than the potato, known in gastronomy in delicious dishes but also in the area of beauty their power to match the skin tone and bleach; besides that you can apply cold to soothe irritations. It helps deflate the bags under the eyes. Moisturizes and nourishes the skin deeply. Raw, make a juice or scratched and apply to the desired area of the face. These are some of the masks with potato or potato. 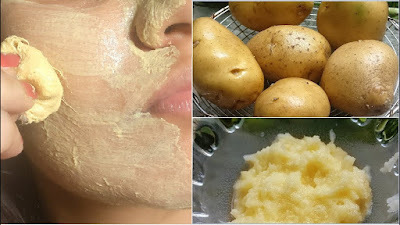 Liquefy the potato and throw him half a lemon juice, you apply on the face for 15 minutes and wash with water. Mix the liquid of medium onion and whole potato juice. Once prepared, apply it on the affected area and allow it to act for ten minutes. Rinse with water. Liquefy the potato with half a cucumber, the juice apply it for 20 minutes and wash with cold water. Mix potato juice and carrot juice and then apply the mixture on your face for 25 minutes. In the end, rinse it off with plenty of water.